Yotsuya 四谷 / 四ッ谷 Yotsuya district - "four valleys"
Shinjuku, 一丁目 - 四丁目 from the first to the fourth subdistrict. 千日谷 Sennichidani, 茗荷谷 Myogadani, 千駄ヶ谷 Sendagaya and 大上谷 Okamidani. 梅屋 Umeya, 保久屋 Hokuya, 茶屋 Chaya and 布屋 Nunoya.
. Koshu Kaido 甲州街道 Kōshū Kaidō Highway . It is a former ward (四谷区 Yotsuya-ku) in the now-defunct Tokyo City. 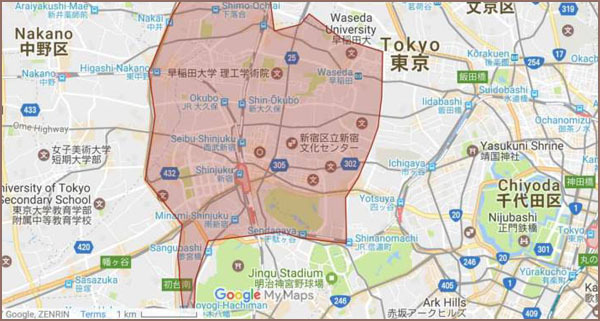 In 1947, when the 35 wards of Tokyo were reorganized into 23, it was merged with Ushigome ward of Tokyo City and Yodobashi suburban ward of Tokyo-fu to form the modern Shinjuku ward. 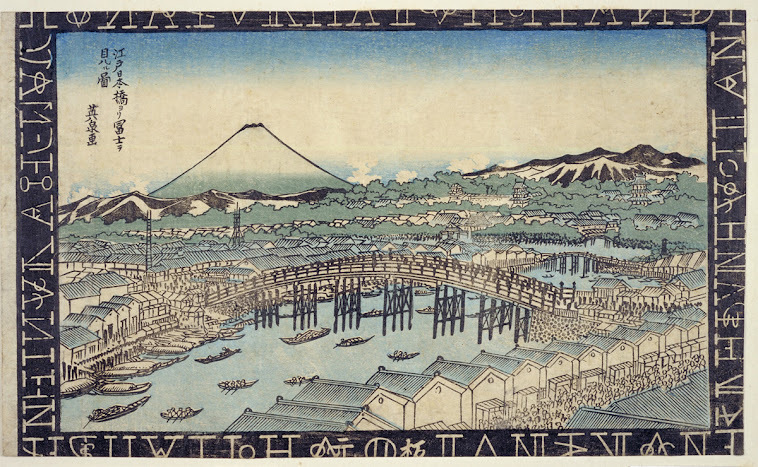 Before the growth of Edo, Yotsuya was a farming village outside the city. 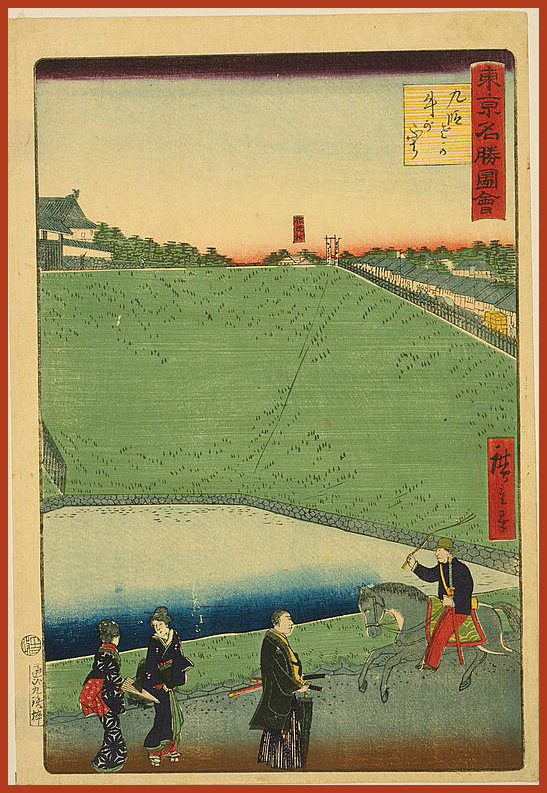 In 1634, with the digging of the outer moat around Edo Castle, many temples and shrines moved to Yotsuya. The moat had stone walls, and a mitsuke, or watch tower, was also built. Yotsuya Mitsuke stood near the present-day Yotsuya Station. The relocation of the temples and construction of the mitsuke brought settlements of workers, and following the devastating Meireki fire, many more people moved to Yotsuya, which had been spared. 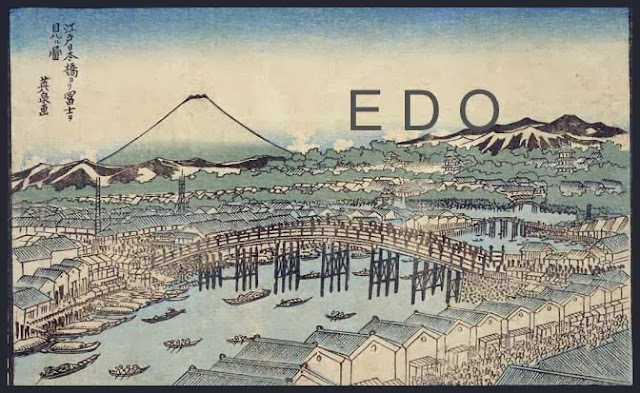 Gradually the area became part of the city of Edo. 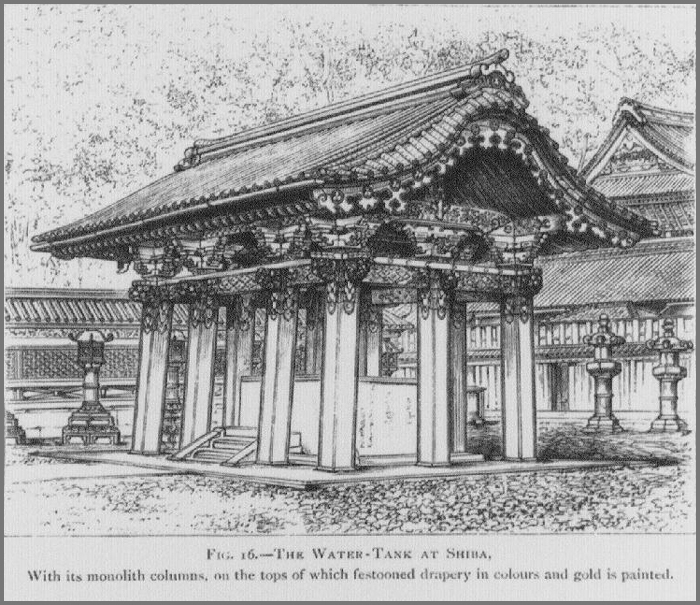 the shōgun Tokugawa Tsunayoshi ordered the establishment of a vast dog kennel. The purpose was to board stray dogs as part of his policy of showing mercy to animals. The facility outside the Yotsuya Gate occupied 20,000 tsubo (66,000 m2; 710,000 sq ft). due to its central location. In 1894, the Kōbu Railway, predecessor of the present-day Chūō Line, extended its existing railway line between Shinjuku and Tachikawa to Ushigome and opened Yotsuya and Shinanomachi stations. 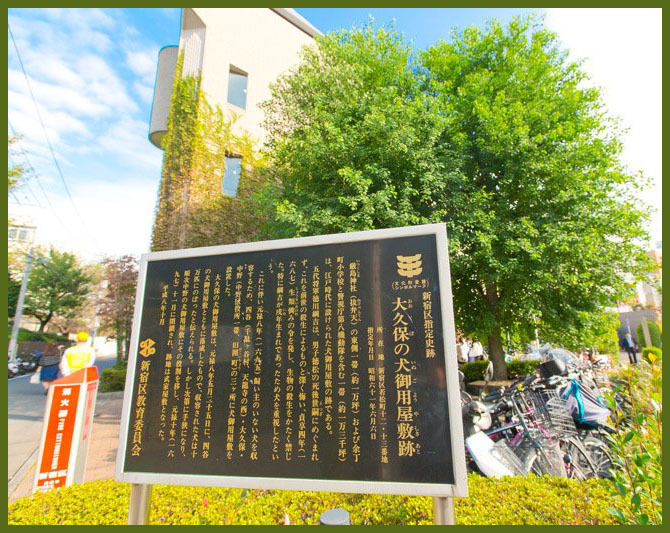 The railway enabled the easy transport of raw materials into the area; soon, pencil, tobacco and other industries moved in and began Yotsuya's rapid industrial development. 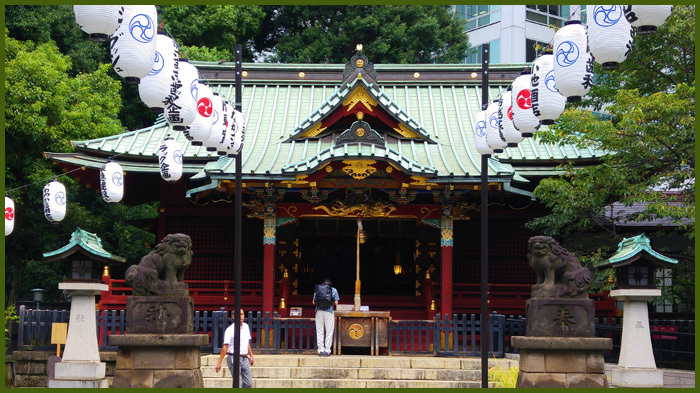 Many historic temples and graves are located in Yotsuya. Among them are Sainen-ji, where the grave of the ninja Hattori Hanzō and his lance are interred. The name of the station is written 四ツ谷駅. In 1695, there were so many dogs that Edo began to smell horribly. An apprentice was even executed because he wounded a dog. Finally, the trouble was taken to a distance, as over 50,000 dogs were deported to kennels in the suburbs of the city where they would be housed. They were apparently fed rice and fish which were at the expense of the taxpaying citizens of Edo.
. Tokugawa Tsunayoshi 徳川綱吉 (1646 - 1709) .
. Legends from Shinjuku ward . the story of Oiwa and Tamiya Iemon, is a tale of betrayal, murder, and ghostly revenge. 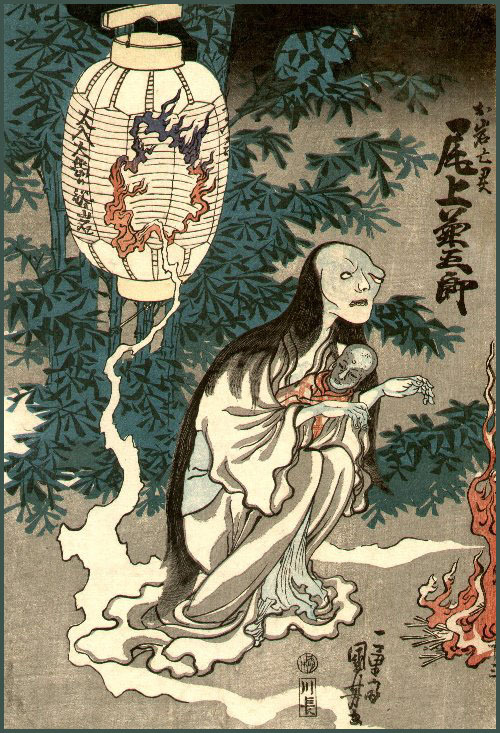 Arguably the most famous Japanese ghost story of all time, it has been adapted for film over 30 times, and continues to be an influence on Japanese horror today.
. Kaidan 怪談 ghost and monster stories . a wife was sitting outside in the evening. She saw an old man with white hair, laughing and coming closer. She closed her eyes and begun to recite 普門品 the Kannon Sutra. When she was finished she opened her eyes again and saw that the woman from the neighbours family had become crazy. In 四ッ谷大番町 Yotsuya Obancho in the year 1977, there was a strong rain at night. The servant of a Samurai came home late and on this way he met a woman. After that he met that woman every night. The Samurai had this man observed. When he lay in his bed moaning, the Samurai drew his sword. Now a black cat jumped out of the bed and ran away as fast as it could. 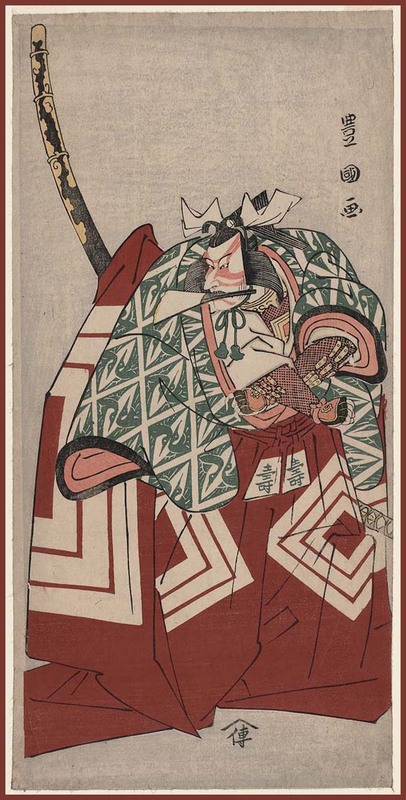 Around 1760, there lived a sword master in Yotsuya, who was riding a kago 籠 palanquin. Part of his robes peaked out and then a tail . . . it was a fox! The palanquin carriers were much afraid and did not get any money. The next day they were bewitched by this fox and eventually thrown out of their families and died alone. On another occasion a person was seen hitting a nail into the sacred tree of the Inari Shrine to curse someone. He was also bewitched by a fox.
. Taira no Masakado 平将門 (? - 940) . One 旗本家 Hatamoto samurai family living in Yotsuya once got the kabuto 兜 helmet of Masakado by some of his descendants in exchange for money. On the first night in the new home, the house begun to scream and squeek and shake and rumble, so next morning they gave it back to its owner. The stone statue of Jizo Bosatsu at the temple Joun-Ji is sometimes dancing . . . but that is just a rumor.
. Shinjuku　新宿区　Shinjuku Ward . At the temple 円照寺 Ensho-Ji in Shinjuku and 豊仙寺 / 宝仙寺 Hosen-Ji in Nakano there are parts of the bones of one huge serpent kept as secret treasures. River water can be poured over the bones for an oracle about coming rain. At the temple Hosen-Ji the waster from the well 井の頭 Inokashira is used for offerings.
. daija, orochi 大蛇 the huge serpent, great snake legends .
. Ochiai 落合 Ochiai district . In 1571, there was a great famine in Edo. From spring to July it was only raining and everything was overflown. 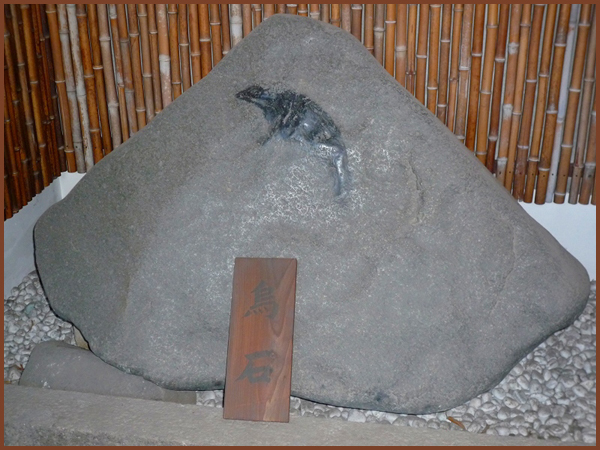 In 落合村の下落合 the village of Ochiai in Shimo-Ochiai there was a mountain priest named 佐貫坊 Sanuki Bo, who had caught a Kappa. 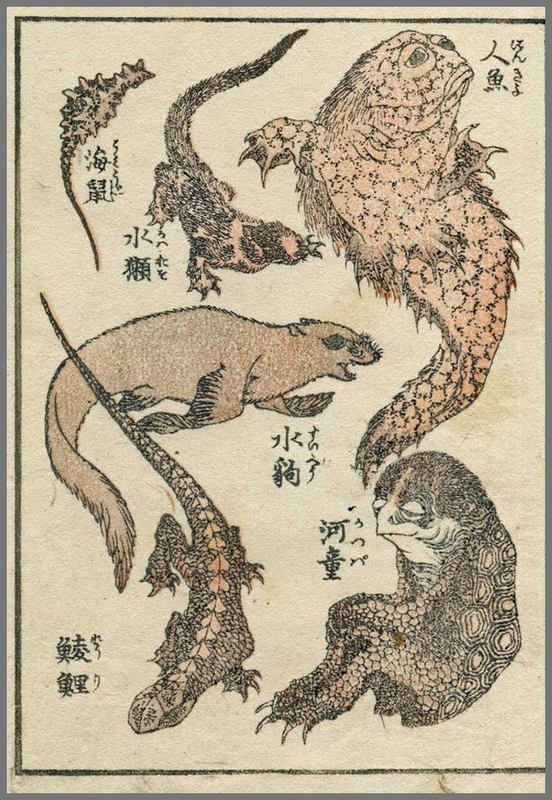 This Kappa had fallen in love with a 人魚 "human fish". Sanuki Bo promised the Kappa that his love would be fulfilled, if he would stop the rain and flooding. Thus he saved the area. Kappa bottom right, human fish top right !
. Ushigome 牛込 Ushigome district legends .
. Yotsuya 四谷 / 四ッ谷 Yotsuya district legends . - - - - - From the Summer of the year 1799. A man caught a strange animal. Then a woman gave birth to eggs. One female dog copulated with two male dogs. A child drowned in a water bucket. After a peace treaty, a man had a sword wound. After a three-day fight for a well started on a 三日月 three-day new moon and ended the next month on the third day. Kamakura Gongorō Kagemasa 鎌倉権五郎景政 - (1069 - ?) lost his eyesight from an arrow wound.
. 霊岸島の七不思議 seven wonders of Reiganjima .
. Edo Nana Fushigi 江戸七不思議 The Seven Wonders of Edo　. At a show performance they paraded a "Tengu", with a robe decorated with feathers of an owl painted all red. Sometimes they use the feathers of other birds. A man had been missing suddenly, but later a letter from him arrived, saying it was too difficult for him to come back home. 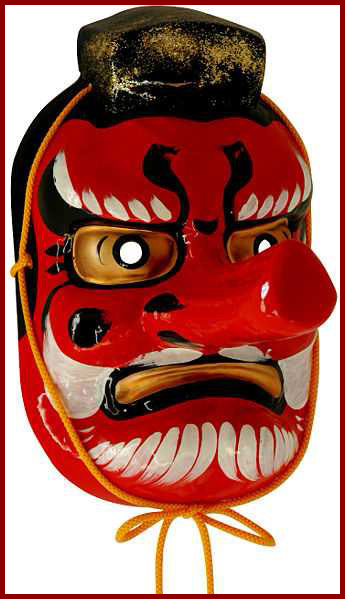 It must have been a Tengu, people thought. The servant of a merchant, about 15 years old, went to the sento 銭湯 public bath. When he came back, he wore traveler's robes and said "I am just home from my family visit!" He even had some presents from home. But at his family house, they have not seen him. He must have been bewitched by a Tengu, most probably. 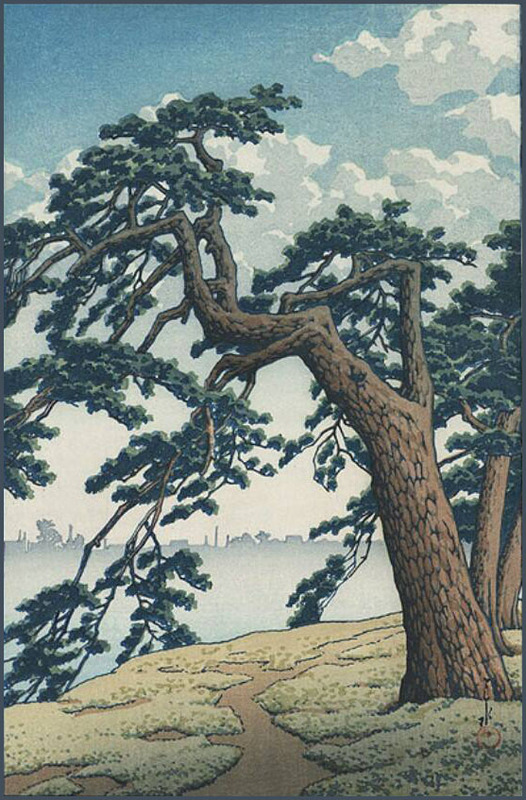 In the year 1813 carpenters cut down a shinboku 神木の松 sacred pine tree to built a theater, but the building was cursed and did not prosper. A few years before that a female servant had been bewitched by a fox and the villagers promised to built a sanctuary, but did not. Another disaster was the sail of a boat catching fire and the mast cracked broken.
. Hatchobori 八町堀 Hatchobori district . The son of a minister 山崎彦左衛門 Yamazaki Hikosaku from lord 松平和泉侯 Matsudaira Izumi, named 山崎彦内 Yamazaki Hikouchi was thrown out of the family and went to Kyoto to become a 陰陽師 Onmyoshi, kind of fortune teller. But he failed and went back to Edo. He changed his name to 渡部帯刀 Watanabe Tatewaki but was found out and imprisoned. Then he changed his name to 蒲生左部 Gamo Sabu and lived in Hatchobori. At that time the lord 神保左京 Jingo Sakyo and his karoo 家老 chief retainer 崎山平内 Sakiyama Heinai became very ill. They asked Sabu for a purification ritual and after that, they soon recovered. He wanted to put the finger in a box and give it as an offering, then the finger jumped up and away, dancing with joy for a while. Nobody knows what really happened. In 江戸八町堀二丁目 the second sub-district of Hachobori in the year 1677 there lived an old hag of about 60 years as a servant. She wanted to let a strange person in, claiming he was the master of the house, but the other servants stopped her. On the evening of the same day the real master of the house lost his mind and died. 本所 Honjo . 回向院 Temple Eko-In, Ekoin . In the spring of 1816, they erected a memorial stone for a cat at the temple Eko-in. A man named 時田喜三郎 Tokida Kisaburo from 両替町 Ryogaecho kept a cat at his home. The fish monger who came to Kisaburo's home every day always gave her some fish, but then he became ill. Kisaburo stole some money from the house and said the thief was the fish monger, so the angry family killed the cat. The fish monger felt pity with the cat and built a memorial for her at Eko-In.
. Honryoogaechoo 本両替町 Hon-Ryogaecho district . In the year 1666 a man named 香具屋九郎左衛門 Kaguya Kurozaemon had too many rats and mice in his home and asked a servant to kill them. The servant took pity on the rats and thought of something to spare them. In a dream he saw a child and said if he spared its life it would give him a gold fish with some Sake. When he woke up he found a gold fish in his mouth. Kurozaemon thought that was quite auspicious and never killed a rat again. The kujaku 孔雀 peacock which had been kept in a cage at the estate in Kakigaracho was killed and the Samurai was very angry about it. 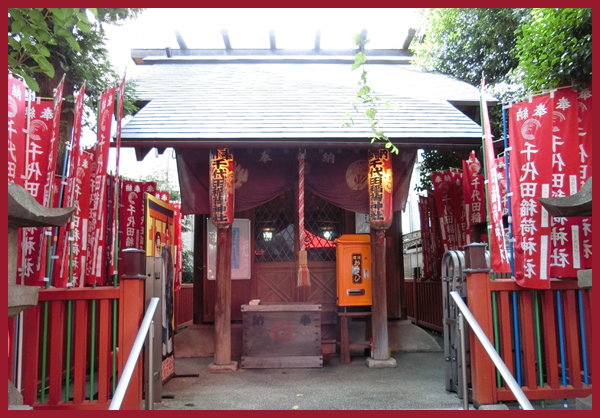 He even destroyed 稲荷の社 the Inari Fox Shrine in the compound. At night a fox appeared in his dream. The fox said he was not responsible for the death and would prove it within three days. The next day the fox appeared again in his dream and said he had punished the criminal. When the Samurai stepped out next morning, he found a large old fox lying dead on his doorstep. On the ground somewhere in Kamimakicho there was mass looking like shikui 漆喰 plaster. The headman sent his manservant to hit it with the ax for splitting wood, but it did not split. So he gave the servant a genno げんのう hammer and now it split. Out came a stone with a soft touch, never seen before. When the headman looked at it in the evening of the next day, it had changed its color to green like tea. The stone soon became the wonder spot of all the people living around.
. gennoo 玄能 Genno hammer . The gennoo type is double-faced and has two round sides. It is used to split rocks or to hit the back of a chisle. It is basically a tool for stone workers.
. Kobikichoo 木挽町 / 木梚町 Kobikicho district . In Kobikicho there lived a poor merchant with his child. The son was very gentle and obedient. One day the son became very ill. His mother thought if he could get some choosen ninjin 朝鮮人参 Ginseng medicine, he might get better, but she did not have the money to buy this expensive medicien. So she bought some normal ninjin 人参 carrots at the greengrocer store and gave them to the ill child. The boy thought it was the medicine from the doctor, drunk it all and was soon healed.
. koorai ninjin 高麗人参 "Korean" ginseng . The maid servant of 佐久間勘解由 Sakuma Kageyu named 竹 Take was very pious and king-hearted, she always gave food to the poor. One day she suddenly died, but her body still felt warm and so they kept her in the house to see what was going to happen. Eventually she came back to life. The people asked her about her experience in meidoo 冥途 the other world. She had walked in an endless plain when suddenly she came to a Golden Hall. The Buddha told her that he knew Take was coming. She started praying, but could escape death and came back to life.
. Yuuten Shoonin 祐天上人 Saint Yuten Shonin . Reiganjima 霊巌島 / 霊岸島 Island Reiganjima .
. Onipedia - 鬼ペディア　the Demons of Japan .
. yomogi 艾 / ヨモギ mugwort, Artemisia princeps . An old man was growing kiku 菊 chrysanthemums and tried to make them grow higher and higher every year, but cutting them down before they flowered.
. Chiyoda ku 千代田区 Chiyoda ward - "Fields of Eternity" .
. Samuhara サムハラ SA MU HA RA divine amulets . A man in Edo had carried a SAMUHARA amulet on his body. When he fell from his horse one day, he was not hurt. 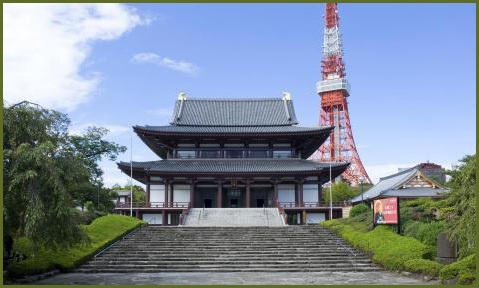 This shrine is famous for its many spiritual experiences when visiting. The Deity is said to prevent fire and many come here to pray. It was erected in 1457 by Ota Dokan to protect his new castle of Edo.
. Edo Bancho 江戸番長 Banchō, Bancho . - . Banchō Sarayashiki, Sara yashiki　皿屋敷 "the Dish Mansion" . ..... where the ghost of 菊 O-Kiku comes out of a well. Okiku and the Nine Plates. In 新道一番町 Shindo Ichibancho there lived the family of 上原庄作 Uehara Shosaku. His wife suddenly found that from her arm about 10 red hair had begun to grow. She pulled them out immediately and found them to be almost 60 cm long. But pulling them out did not help, they soon grew back. Once she had peed on a place with black gravel. A doctor tole her, this must have been the deed of a fox or badger. On the 11th day of the second lunar month in 1827, on the night before the festival of the First Day of the Horse, the low-ranking Samurai 幸吉 Kokichi from 新道一番町 Shindo Ichibancho told his master that he was off to the Morikawa Inari shrine, where he lived. Next morning his master found a wooden statue of Inari at his doorstep. From this day on, if he had a wish to make to Inari, he would ask Kokichi to mediate for him. 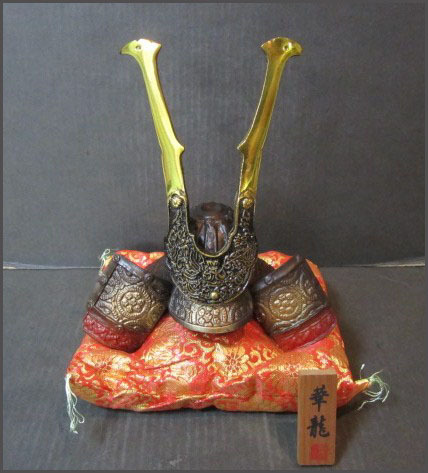 On the first day of the third lunar month, his master and 若殿 the young lord made an offering of ritual Sake for the Deity. Looking closer the next day, half of the Sake and the other food offerings were gone. So they thought the Inari deities from Sanko-In and the Koshikake Inari had come too.
. Inari 稲荷神社 fox shrines in Tokyo .
. Hibiya 日比谷 / 比々谷 Hibiya district legends .
. Kajibashi 鍛冶橋 Kajibashi Bridge . In the house of 堀大和守 Lord Hori at Kajibashi bridge, his servants observed a rat that would place a small piece of 南鐐 silver into an offering box at the kamidana 神棚 shelf of the gods for about 14, 15 days in a row. The couple of the house was very happy and begun to use the money for shopping! And well, you guess, the rat never showed up again.
. Kanda 神田 Kanda district legends .
. Konyachoo 紺屋町 district for indigo cloth dyers . A servant from a metal dealer at Konya-Cho went out to do some errants. When she came back home, she realized that someone had cut off her hair without her noticing anything. When people pointed with their fingers at her head, she was so embarrassed she lost consciousness.
. oyako tanuki 親子狸 parent and child badger legend . Otama-ga-ike お玉ヶ池, close to 東紺屋町 Eastern Konya-Cho.
. Koojimachi, Kōjimachi 麹町 / 麴町 Kojimachi district legends . The canal at the slope Kudansaka 件坂下 / 九段坂 is called 牛ヶ淵 "riverpool of the bull". Once upon a time, a man called 石川新六 Ishikawa Shinroku got up early and passed here around the ushimitsu 丑三つ cursed hour, with a lantern hanging from a stick. He saw a man with his body cut in half, just the upper body was visible. When he went there later to have a look for the lower body, there was nothing, not even the upper part any more.
. ushimitsu 牛三 the double-hour of the bull. from one to three at night make a curse.
. 九段坂　- 牛ヶ淵　Kudanzaka Ushigabuchi .
. kuchisake onna 口裂け女 slit-mouthed woman . from Sangenjaya 三軒茶屋 Sangen-jaya, "three tea stalls" . Once a doctor named 岡本玄意 Okamoto Genya walked with another doctor along the 弁慶堀 Benkei-Bori moat. They saw a strange dog, walking like a man. Another man tried to press the monster down, but could not do it. Then came a carpenter back from work and dispelled the monster. The other man went to his lodgings and developed a high fever. Hamadaya is the name of Okiya, a house where Geisha lived,in the Meiji period(1868-1912). One famous geisha from Hamadaya was Kawakami Sadayakko (1871-1946) who later became Japan's first international superstar. Madame Sadayakko toured Europe and the U.S. with her husband Kawakami Otojiro and gave performances. Her presentations were very well -received and she gained great popularity. 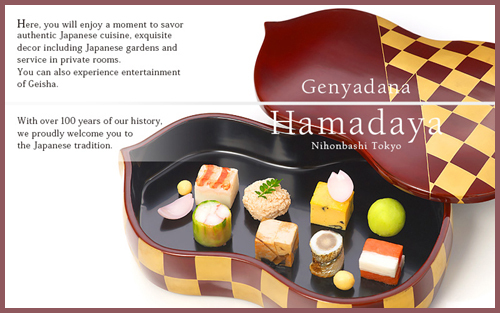 A high-class Japanese restaurant called Hamadaya was founded in 1912 after the first owner of restaurant inherited the name of long and distinguished history of Sadayakko. a doctor who lived here in the Edo period (1600-1867). Genya was a doctor of the Tokugawa Shogunate. When Tokugawa Iemitsu, the third shogun of the Tokugawa dynasty, fell ill of small pox, Genya treated the Shogun Iemitsu and completely cured Shogune of the disease. Genya leaped to fame as a good doctor. His descendants lived in this area for nine generations and continued the profession using this grand family name.
. reiken 霊剣 the magic sword .
. shachihoko 鯱 gable decoration .
. dokuro 髑髏と伝説 Legends about the Skull .